In ancient times, the Circus Agonalis stood here, a competition venue for ancient athletics based on the Greek model. The old stadium was built in the same elongated shape. 30,000 spectators were seated in the Arena Circus Agonalis. The grandstands were around the square where the houses and churches stand today. 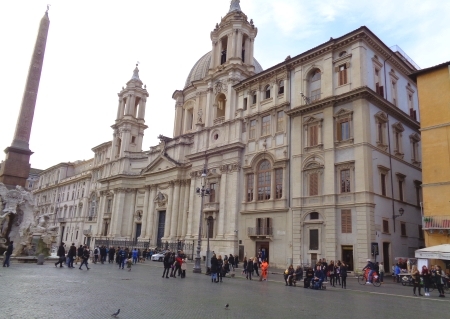 The large church in Piazza Navona is the baroque church of Sant’Agnese in Agone (Italian: Sanctae Agnetis in Agone) from the 17th century. Pope Innocent X built the church. The tomb of this pope can be found in the church of Sant’Agnese in Agone. Tourists love the three magnificent fountains on Navona Square. The most famous fountain is the middle one called the Four Rivers Fountain (also known as the Four Streams Fountain, Italian Fontana dei Quattro Fiumi). The fountain dates from 1649 and was built by the famous artist and architect Gian Lorenzo Bernini. It symbolizes 4 large rivers on the then known 4 continents (Nile for Africa, Danube for Europe, Ganges for Asia and Río de la Plata for America). The 5th continent Australia was already discovered at this time, but hardly explored. The second fountain is somewhat older (16th century). The Fontana del Moro (Moor Fountain) was redesigned by Bernini. The third fountain is the so-called Neptune Fountain (Fontana del Nettuno). The main figure is especially worth seeing: The Roman god of water Neptune is depicted in battle with a large octopus. This sculpture was only created in the 19th century by the artist Antonio della Bitta. 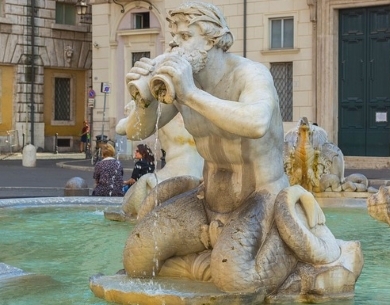 There’s always a lot going on in Piazza Navona. Artists, street musicians, souvenir shops, cafes and taverns cavort on and around the central city square. Piazza Navona is in the centre of Rome. Sights nearby are the Pantheon and the Campo di Fiori market square. At one end of the square is the palace „Palazzo Braschi“. Today this old building houses the more than worth seeing city museum of Rome. The Museum of Rome aims to document the history and traditions of the city. But it is also an important art museum. Opening hours 2019: Tuesday to Sunday 10 to 19 o’clock. Closed Monday. Otherwise, the Rome City Museum is closed only on the 3 holidays New Year, 1 May and 25 December. On Christmas Eve and New Year’s Eve the opening hours are reduced to 10 a.m. to 2 p.m.. Entrance fees: The Museum of Rome costs 11 euros. There are reduced admission prices and family tickets (22 euros). Admission is especially worthwhile if you are interested in art. 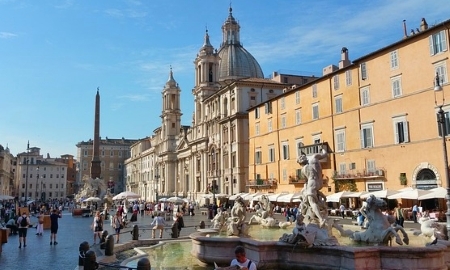 Piazza Navona is an important square right in the centre of Rome.